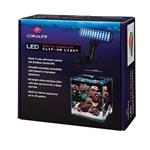 The Coralife Marine Aquarium LED Clip-On Light is ideal for marine aquariums up to 20 gallons. It features a quick 3-way soft-touch control (all on/blue on/ all off). The 60 bright white and blue LEDs give a bluish deep sea look. The versatile mount is compatible with framed or frameless aquariums. The clip that attaches to the back of the tank expands to a maximum of 3/4". Peak PAR=47. Avg PAR=26. Peak LUX=2612. Avg LUX=1512. The average output is at 12" from the center of the light in a 16" X 16" area. For fish-only saltwater aquariums. Not for reef aquariums. This Coralife Mini LED Aqualight fixture is a versatile light that is ideal for small aquariums, nano tanks, sumps, and refugiums. The adhesive mounting brackets allow for vertical installation. The legs extend from 12" to 18" wide to fit a variety of smaller aquariums. It's 3 times brighter than the previous NON-LED version.